The most common problems when you are experiencing the P0339 code is a problem with the crankshaft position sensor or a faulty wirings to it. But don’t just replace parts! Read the article and I will explain how to diagnose it properly and repair it for the lowest cost. In this article, You will find information about what the P0339 code means, and what the most common problems are to solve it in the fastest and cheapest way. What does the P0339 code mean? The P0339 trouble code is triggered when the engine control unit gets an intermittent high signal (Voltage)/Faulty signal from the crankshaft sensor ‘A’. The crankshaft sensor’s job is to read where in the cycle the crankshaft is. It is used to know when to fire the injectors and the ignition coils. 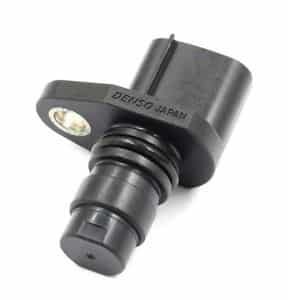 The car will also get the RPM showed at your dashboard from the crankshaft position sensor. Because of the important task of the crankshaft sensor, your engine may stop while driving and do not start again if you get this trouble code. The crankshaft sensor’s signal is required to make the engine run and the control unit may not open your injectors and fire the spark plugs if it gets a faulty signal from the crankshaft sensor. What is the function of the crankshaft sensor? The crankshaft sensor is often fitted at the front or the rear of the engine. On some cars, it is reading the signal from the flywheel of the clutch and may be fitted on the gearbox case. It can also be fitted at the front harmonic balancer and read the signal from a trigger wheel ( See picture ). The trigger wheel is missing one tooth so the crankshaft sensor knows when the engine has been turning one full turn. The crankshaft sensor can also be fitted to your engine block and read the signal internally from the crankshaft inside the engine block. Sometimes if the harmonic balancer, flywheel or internal trigger wheel gets faulty, it can damage the crankshaft sensor and make the engine control unit to trigger the P0339. When you get this trouble code, visually inspect the crankshaft sensor if possible. The most common symptom of the P0339 code is that the vehicle is not starting or shutting off the engine sometimes. The engine light is often ON when the P0339 code is stored. Your car could also be in Limp mode if the code is stored in the engine control unit. The most common fault of this trouble code is actually a internal damage in the crankshaft position sensor, but there are several causes for this trouble code and I recommend to diagnose the problem carefully before replacing any parts. NOTE: The P0339 could also get triggered if you car had low voltage from the car battery. If you know that your car had a low voltage when the trouble code occurred, charge or replace your car battery. Replace Crankshaft sensor if faulty results. This is how a skilled automotive technician would diagnose the P0339 code. You may need some special tools to fulfil this diagnose guide, but you can check it out to get a clue of how to do it. Always connect a car battery charger when you are doing any diagnoses to your vehicle. Low voltage can give you false results and even damage your control units. Check the live data for “Engine RPM”, Crank the engine and see if the RPM is raising or not. If you get no result you should continue to the next step. If you get results, the trouble code may be intermittent and should be tested again when the car is not starting. Visually inspect the crankshaft sensor and the trigger wheel. Unplug the connector and check for corrosion. Measure the Ohms inside the crankshaft position sensor with a multimeter. If you get no results = Open circuit inside the sensor. Replace Crankshaft position sensor. Check the repair manual for the correct Ohm result. If you get the correct value, measure the ohms from the engine control unit connector with the sensor connector plugged in. If you get no results here you do probably have an open circuit in the wirings. If the sensor seems ok, check the signal from the sensor with an oscilloscope ( Advanced ). Then check the signal at the engine control module connector and check if you get the same results. Not the same results = Faulty wirings or shield wire. If all results are OK and inspected carefully, replace the crankshaft position sensor as it may be an intermittent fault. If the sensor got the right distance, replaced and you have checked/measured the wirings and you still get the same trouble code. You may have a faulty Engine Control Unit. If you have any other questions about the P0339 code, comment down below and I will answer your question as fast as possible. If you have any other car related questions you are welcome to ask us at our homepage. This problem will most likely not be caused by the spark plugs!